On Wednesday, Trump fired Secretary of Veterans Affairs David Shulkin and said he’d replace him with White House physician Dr. Ronny Jackson, a rear admiral in the Navy. Dr. Jackson has no experience running a large agency. The department is the federal government’s second-largest. On Wednesday, President Trump fired Secretary of Veterans Affairs David Shulkin and said he’d replace him with White House physician Dr. Ronny Jackson, a rear admiral in the Navy. Dr. Jackson has no experience running a large agency. 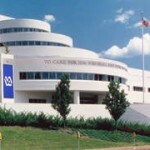 The Department of Veterans Affairs is the federal government’s second-largest department, with 360,000 employees. Shulkin had been facing criticism for various ethics violations, including using taxpayer money to pay for his wife’s airfare during a trip to Europe last summer. But Shulkin says he’s actually being ousted because of his opposition to privatizing the VA, which runs 1,700 hospitals and clinics. The push to privatize the VA has been led by a group called Concerned Veterans for America, which is funded by the billionaire conservative Koch brothers. On Saturday, members of the scientific community, family, friends and fans alike will gather to remember the life and legacy of groundbreaking physicist Stephen Hawking. Hawking died on March 14 at his home in Cambridge, England, at the age of 76. For decades, Hawking enchanted both scientists and science lovers by making groundbreaking discoveries about the origins of the universe, then translating these ideas for millions of nonscientists worldwide. His career and life itself have been celebrated as a medical miracle. Born in Oxford, Britain, in 1942, he was diagnosed with a neuromuscular disorder known as Lou Gehrig’s disease at the age of 21. Doctors said he had only a few years to live. Instead, he went on to live for more than 50 years, traveling the world in his motorized wheelchair and communicating through a custom-made computerized voice synthesizer. His only complaint was that the synthesizer gave him an American accent. He also protested against U.S. wars, including the U.S. war in Vietnam and the U.S. invasion of Iraq.